Just before Christmas Brian Kelly wrote a post on Trends For University Web Site Search Engines, which gives an overview of which search engines [Edit: Russell Group*] universities are using on their websites (75% using Google products) . This combined with my interest in Learning Analytics (plug: it’s week one of the open course LAK11 Learning and Knowledge Analytics), got me wondering how many institutions uses information about their visitors to customise content. There are a number of ways you could potentially do this from using media campaigns to using one of the Facebook Social plugins. The question of what is already being used is probably best answered by someone else, like Brian, instead I’m going to highlight one other simple way that you might customise the visitors experience (and at the same time improve how information on this blog is presented), by using Search Referrer information. For the majority of users when they navigate around the web they leave a ‘referrer’ trail. When they land on a page that site can usually see where the person came from (if you read the HTTP Referrer entry on wikipedia you’ll see why this information isn’t always available). Monitoring tools like Google Analytics can track referrer information so that you can track where your traffic is coming from. I use Google Analytics to monitor traffic to this site and whilst I don’t use this data extensively (although I did modify the Google Analyticator WordPress plugin to display top posts based on Analytics data), it is useful information to check the general health of my blog. When monitoring referrer information it is possible to record the whole web address of the page with the click through link including the query string (junk at the end). For example, if you were to open this page http://www.google.co.uk/search?&q=jisc+rsc+mashe and click on the link for this blog, if your browser is passing referrer information I can see you got here from a Google Search for ‘jisc rsc mashe’. 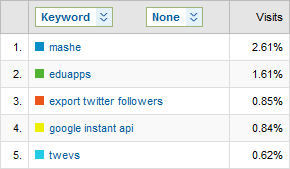 In fact I know from my Google Analytics data that in 2010 over a third (37%) of my visitors arrived via a search engine, almost all (97%) using Google and as the table shows I even know the main search keywords used. So if I know over a third of people end here having searched for something, wouldn’t it be good if I could highlight more of my content based on their search? Hopefully our answer is yes otherwise I’ve wasted a hell of a lot of my own time chasing my tail on this. Rather than completely reinventing I had a quick look at some existing WordPress plugin’s to see if anything would do this. The one that came closest was WP Greet Box which as well as providing a custom greeting message based on where your visitor is coming from if the user comes from a search engine it uses that search query to optionally display some related posts. The problem I had with this solution is, as well as thinking the greeting was a little tacky, it only suggests related posts. As this blog has evolved I have more bespoke pages and tools which is why I use a Google Custom Search Engine (CSE) (combined with some of my own ‘instant’ magic to let people search all of the material in the MASHe directory. Finding nothing else and as I already use the Contextual Related Posts plugin I thought it would be fun to modify this so that if someone lands on one of my posts from a search engine, their search query is used to pull related material using my sites Google CSE. Personally I’m not entirely convinced that this will have any impact on driving traffic internally within this site because my volume of visits is relatively low and the placement at the end of the post isn’t optimum for leveraging extra content. The other factor is normally in posts if I’ve written or have a related tool that might be of interest to the reader I include a link in the body of the post. But if nothing else maybe you’ve learned a bit about referrer information and you’ll come up with a better idea than me. This was the PHP function I used to get multiple pages from the Google Web Search API – BTW Google recently announced that this API is now deprecated. You can still use it until November 2013. There is a new Custom Search API to replace it but as it’s rate limited to 100 queries per day I would just keep using the old one.